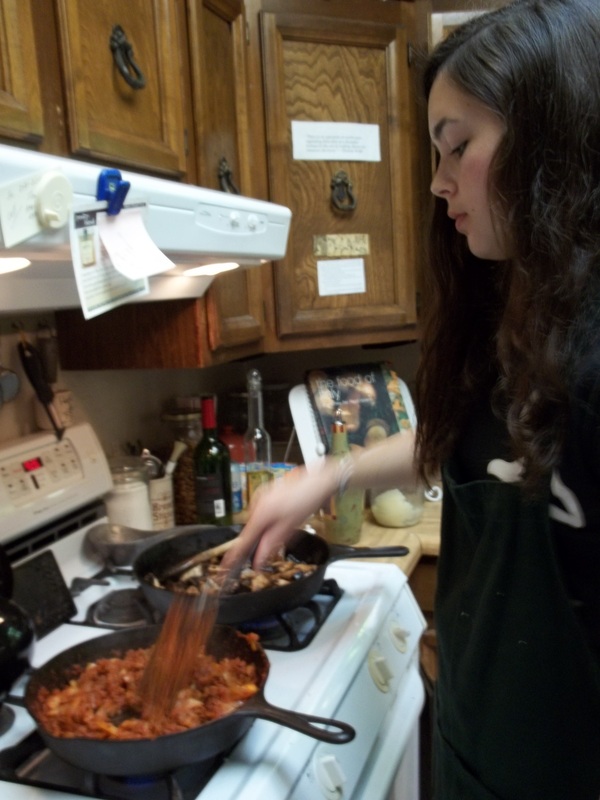 Alex and my pasta-making adventure last week brought forth a lot of family reminiscing. 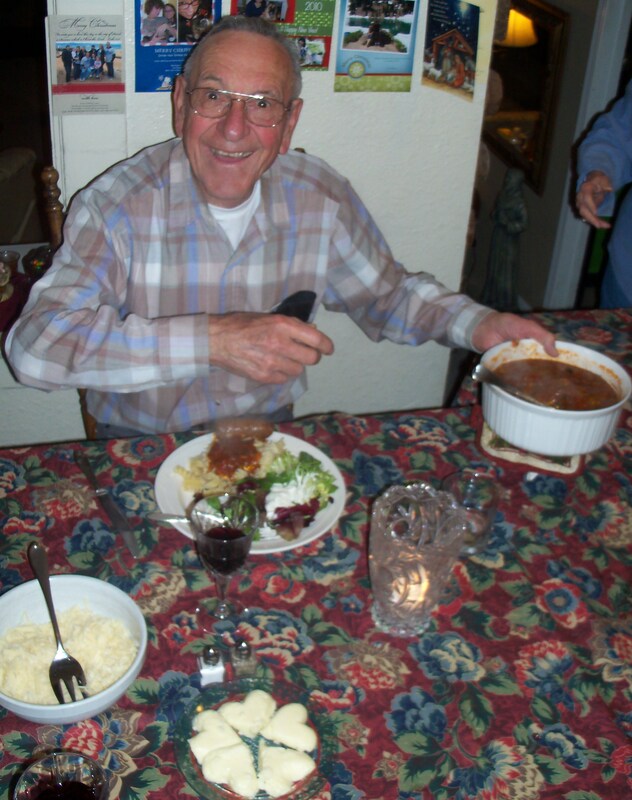 John says his main memory of his grandma’s pasta was that she put the noodles into broth. His Grandpa Guido, on the other hand, served pasta shuta. Pasta Shuta. The “u” is pronounced sort of like “oo” …and be sure to use some force with your tongue when you pronounce the “t”. And of course, don’t forget to wave your hands extravagantly for emphasis. Now that’s Italian! John says he thinks “pasta shuta” means dry pasta – as opposed to noodles floating in broth. In other words, it’s pasta in red sauce, or gravy. By the way, I was tickled to hear from my friend and paisana, Stephanie, that her very Italian family – the Famiglia Rizzi – also calls the red stuff gravy. But whatever you call it, today I offer you my recipe for the red sauce that goes over pasta. There are certainly more difficult recipes, and there are those which don’t use canned products, but over the years I have had much applause for this fairly authentic tasting sauce. I hope you try it and like it! Brown the Italian sausage links in heavy skillet, piercing them to let some of the fat out. When they are pretty well browned, transfer them to a large heavy soup pot. Most of the time I use my large crock pot. Who doesn’t love to get a whole Italian sausage on his plate?! 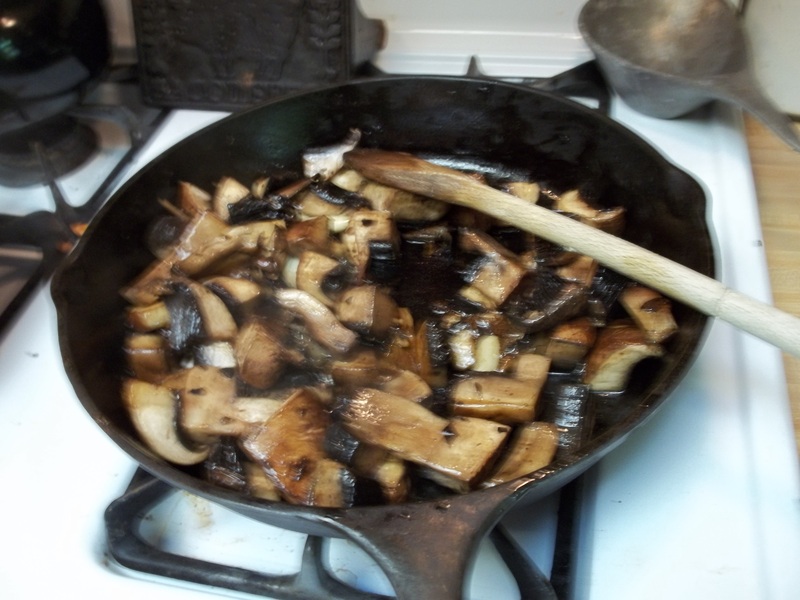 Begin to sauté the portabella mushrooms and bell peppers in the same pan in which you cooked the sausage. 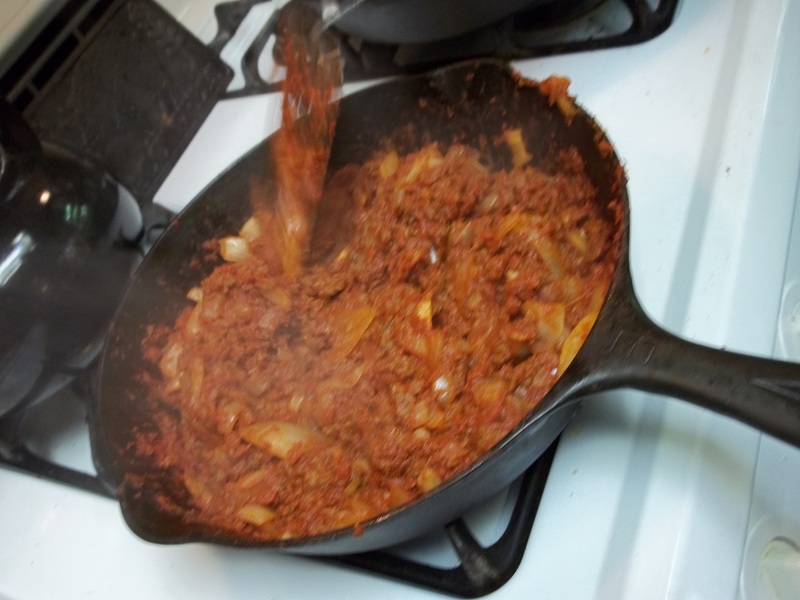 When the meat is browned and the onions are mostly cooked, add both cans of tomato paste. Cook, over a medium heat for about 10 minutes, until the tomato paste begins to look brownish. This is a very important step. As you stir the mixture make sure you scrape the bottom of the skillet so the sauce doesn’t stick and scorch. 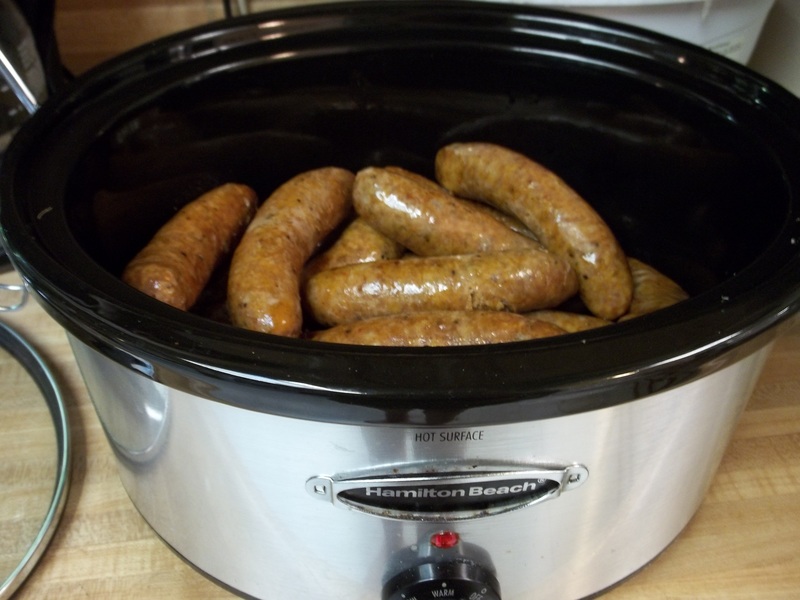 Spoon the ground beef mixture onto the sausages in the crock pot. Put about half a cup of water into the skillet to loosen all the sauce that is sticking to it, and pour that into the crock pot. Add the mushroom and peppers. 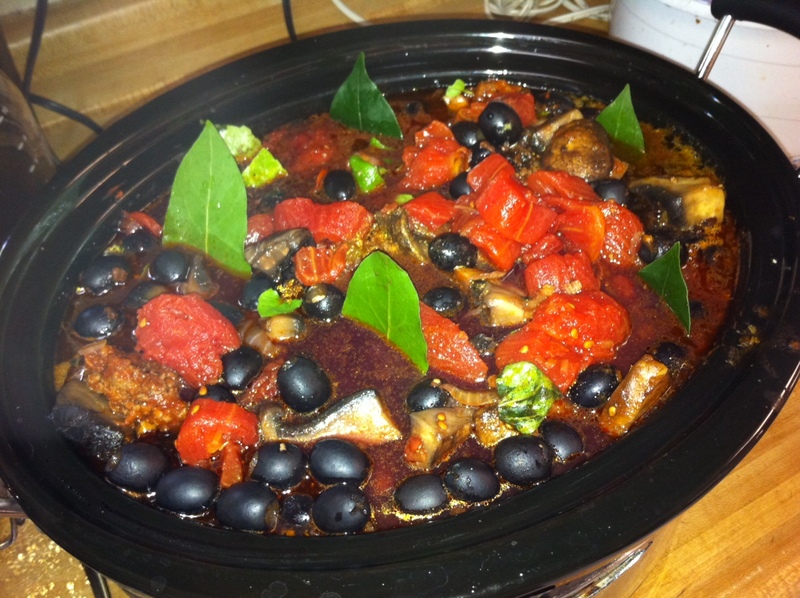 Now pour in the cans of tomatoes, and the olives (including the brine) Add the basil, oregano, bay leaves and red wine. Mix everything together. You can add another can of tomatoes if you like, or more olives. Or play with the garlic. Sometimes I put in some of my pesto if I’m short of basil or garlic. Simmer it for at least 8 hours. This recipe is featured in Recipes from Paladini Potpie, available now in paperback for $7.95! Oh, I so enjoyed your recipe. Sal’s family is Calabresi and his grandfather was Frank S (also a grandpa Frank). The picture caught my breath; your Grandpa Frank looked like Sal. I think is was the eyes and head (perhaps the lack of hair). Thank you for sharing. Oh, and it definitely is gravy! Now what do we call the breakfast white gravy? Love your response Priscilla! And you should know!!!! It is so much fun to read your ‘ancient’ family recipes! I’m that cooking nerd that enjoys reading cookbooks, so ANY time you post a recipe, I HAVE to go look, right away! Giggles and thanks for the simple pleasure of reading about good cookery!